I have one or two forums I'm leaning towards but my plan is to hold back and wait on fully immersing myself into a forum until a few weeks after AT's closing. I feel most of the forums created will see a surge in activity but quickly will go inactive as members gravitate to one main forum. Regardless I'll be participating in the DotW thread in whatever forum we ultimately decide But for my main tarot-socializing I'll want to be where most the activity is long term. I agree with you Daughter of Danu. I am surprised at the number of new forums sprouting everywhere, and many are very nice and welcoming and seem to be perfect.... but I doubt that they can all thrive at the same time in the long run. In any case, many seem great, and I will be happy to join wichever becomes the home for DOWT. Yeah, I find it all a little intense at the moment! On one hand I wish there had been some more co-operation between the people starting the different forums because I find it too chaotic for my liking with all the options, but on the other hand it's good that people are doing something about this and moving forward since I think saving this forum is a lost cause. I checked how many members there are in the forums I'm in or think is a candidate to move to and aside from the cartomancy forum which has almost 800 members at the moment the rest of them (littlefang, mysticreadings and tarosphere) are all in the 130's. So I'm curious how it's gonna look when AT close down and things stabilise themselves. Carojulie, great deck interview! I like those questions. I'm still reading about the courts off and on, so again for this week, I thought I'd pull all the courts of The Wild Unknown together and have a look at them. They are brilliant! I love the Wands, they're so vibrant, and Pentacles are so grounded and earthy, and the Swords are so focused. 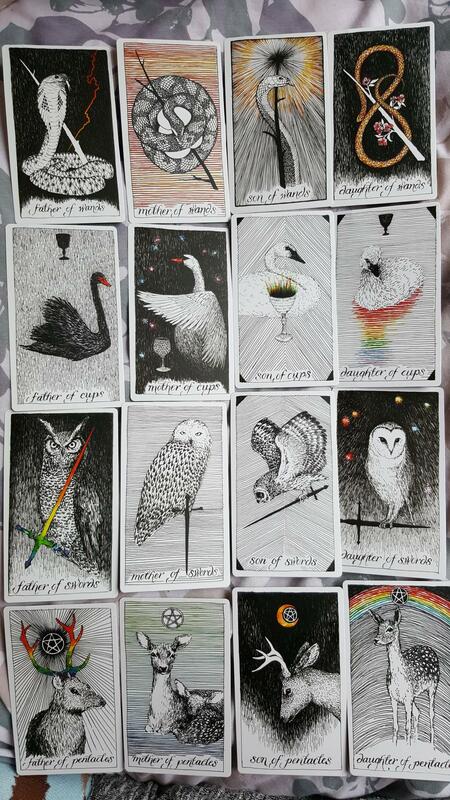 King of Cups is my least favourite, and I can't pick a favourite. VGimlet please add me to this week's study group list thank you. Done - I have been busy with work the last few days and haven't come here to check thread. I am just going to post my opinion here. Most people from AT have gone to Cartomancy http://cartomancy.forumotion.com/ and they have welcomed them with open arms and opened new subforums as needed, and as they see how many are there to stay. We could start by posting a thread under Tarot Deep Dive. Seems like the perfect place for it. I'm going with a poll, more to keep things simple and visible than anything else. Except if a few of you would rather PM me privately. The new, and last ever, thread is here. The poll for us to vote on our new home is here. A lot of people have been part of the DOTW group over the years, so lets see how it goes - if it looks like more people are voting than have every used the DOTW we'll figure something else out this weekend. But we will have a decision by Monday. Dangit ... went into the wrong thread! So, I finally finished "going through" the Sedona Vortex Tarot. It is certainly different! The suits are based off of four vortex locations around Sedona, but they have RWS equivalents; Boynton Canyon=Pentacles, Airport Mesa=Wands, Cathedral Rock=Cups and Bell Rock=Swords. The Majors have the same names as the RWS Majors, except The Devil, which is named "Guardian" in this deck and The World is named The Universe (which is not unusual. 1 (What will you teach me? ); The Moon; Basically, I felt this would be stretching my intuition and expanding my psychic abilities. 2 (What do you need from me? ); The Magician-rx; I felt that this indicated a need for contemplation rather than practical use. Relating to The Moon, needing spiritual work rather than simple readings. 3 (What will our relationship be like? ); The Star; A happy outcome and relationship with this deck. Overall, I don't think this is a deck that will work well doing readings for folks on their earthly concerns, but will be excellent to use in continuing my spiritual growth. I was actually pretty surprised by the reading for some reason. I don't think I've had a deck which has given me a new deck reading like this. Thank you so much VG! This past week, I've been using the Karma Tarot for my readings. The cards were painted by an artist who had lived in Freetown Christiania, a commune-like community in Copenhagen and is based on the people there and her experiences. The deck is fascinating, it is plain to see that it is based on the RWS system, especially in the Majors, though the imagery of the Minors can vary greatly from Waite's work. The images are colorful and really portray their meanings very well. I have found that this deck, for me, tends to give kind of ... "negative" readings. By this I mean that it seems to be quite blunt about things you need to work on. It will point out an area to be worked on by saying "hey, this is screwed up - fix it". Sometimes with a virtual smack to the back of the head. It isn't dark-feeling, it is just very direct. The readings I've been getting, while being blunt, have been very good and quite helpful. All-in-all, I am really loving this deck and am very glad that I got it.